This article is about the Haunted Hotel in IMG Worlds of Adventure Theme Park in Dubai. Dubai is a place of possibilities. Dubai’s hospitality amazes and thrills the visitors. It will now also haunt visitors as an added adventure. IMG Worlds of Adventure is Dubai’s latest theme park, and one attraction visitors should check out is the haunted hotel in the park. This Hotel is an indispensable part of IMG Worlds of Adventure. The new attraction will be situated in the IMG Boulevard zone, providing tourists who want something that’s unique. Lots of spooky stuff and hair-raising thrills are sure to be had from this haunted hotel. 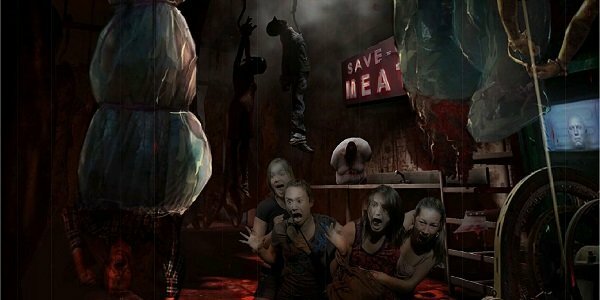 IMG Theme park’s price includes the haunted hotel attraction. The reviews have been great. Kids and family members can get ready for their spooky dose at this Haunted hotel. Lennard Otto, IMG Worlds of Adventure chief executive officer, said the company was delighted to open the Haunted Hotel, which is sure to spook the guests and give them memories that’ll last a lifetime…despite their wish to forget them. This is going to be the spookiest hotel as claimed by a few sources. Every part of the hotel is designed to haunt and thrill visitors. IMG World of Adventure, which is a 1.5 million square feet facility, can hold up to 30,000 people per day, and officials anticipate that 4.5 million visitors will come during the first year. Tickets can be bought through the company’s website for Dhs 300 for adults; Dhs 250 for kids. Otto said he knows travellers have their pick of hotels, and they wanted to come up with a unique gimmick that would sway others to visit and stay. He said it was how the Donovan brothers ran their business and approached hospitality that convinced them it was the way to go. Doors to the IMG Worlds of Adventure opened on Aug. 15 2016, becoming the world’s biggest indoor theme park. It has four zones – Cartoon Network, Marvel, IMG Boulevard, and Lost Valley Dinosaur Adventure. It will have 20 attractions and rides, and 25 retail concept stores and nearly 30 food and drink outlets. It is interesting to see the attention that the Haunted hotel in IMG World of Dubai is garnering. It is one of the most sought-after attraction at the largest indoor theme park in the world. While it’s spooky and named Haunted, it might not invoke the same emotions that some other Haunted Hotels in the world can invoke. There are a lot of haunted hotels which are not haunted by choice but due to real life incidents and ghosts. We have named a few of the haunted hotels in our post of 15 Top Haunted Hotels in the world. In fact, it is one of the most interesting facts about the hospitality industry today that Ghost Tourism and haunted adventures are now widely popular across the globe. So, if you are one of those who loves spooky adventures, don’t miss this haunted hotel while visiting the IMG Worlds of adventure theme park Dubai.